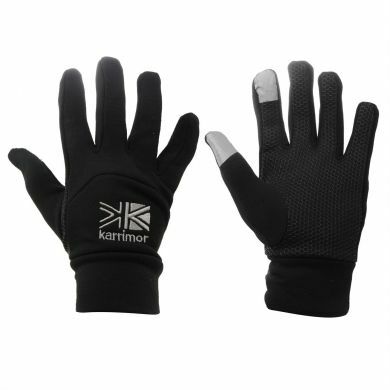 These thermal gloves from Karrimor benefit from touchscreen sensitive tips on the thumb and index finger of each hand. They also feature a fleece lining to ensure your hands stay insulated from the cold, yet they are thin and lightweight enough to be used as outdoor sports or running gloves, or glove liners. There is a rubberised mesh grip section on each of the palms, and an embroidered Karrimor logo on the back. Available in 2 ladies sizes (extra small and small / medium) and 2 mens sizes (small / medium and large).